The flu, especially H1N1, is big news today. The words “Swine Flu” invoke fear and even panic. The general focus on dealing with the flu is with vaccines and drugs. However, your body’s first line of defense against the flu, real food, is all but ignored. Hippocrates of Cos is perhaps the most famous physician of all time. He is known as the father of medicine. He wrote the Hippocratic Oath, which used to be taken by all doctors. He is famous for his dictum, “First, do no harm.” What is not so well known is that Hippocrates advocated using food and other natural methods first, before anything else was tried. Drugs would only be used if the more natural methods failed, and surgery was used only as the last resort. I have followed Hippocrates’ advice, and it has worked very well for me, my family, and others. Traditional peoples knew which foods could heal and prevent many illnesses. This knowledge was gained by observation, sometimes over thousands of years. After much research, I have combined a number of these traditional healing foods into one broth. I call this Quadruple Healing Broth. We have found this broth to be a cold-buster and a flu-stopper. Chicken soup is one of the most famous home remedies for colds and the flu. Recent studies have found that chicken soup has anti-viral, anti-bacterial, and anti-inflammatory qualities. The nutrients in a good chicken soup will strengthen your immune system, giving your body the nutrients it needs to heal itself. Onions were prized by the ancient Egyptians, the ancient (and contemporary) Indians, and many other peoples for their healing qualities. Green onions were valued by the Chinese, who often ate them daily and used them to treat colds and the flu. 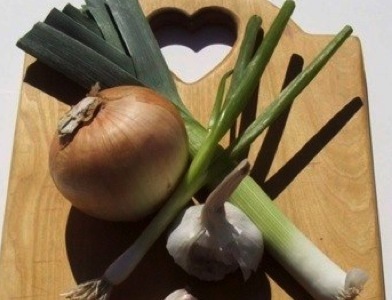 Leeks were also used by the ancient Egyptians for healing all sorts of ailments, and were so loved by the Welsh that leeks became a symbol of Wales, signifying pride, strength, and health. Garlic was used for healing by the ancient Egyptians, the Indians, the Chinese, and many other peoples. Garlic has many anti–inflammatory, anti-viral, anti-bacterial, and immune-boosting qualities. However, it must be understood that all foods used for healing by traditional peoples were organic and were not GMO. Modern factory versions of these foods are very different and just will not work. The chicken soup was always made from scratch. You cannot pour health-giving nutrients out of a can, or extract them from a bouillon cube. Quadruple Healing Broth is the cornerstone of our Hippocratic first line of defense. At the first sign of a cold or flu, we sip plenty of this broth, hot, not scalding. Usually, a few cups of this broth (sometimes only one or two), is enough to stop the cold or flu in its tracks. However, sometimes you cannot sip broth because you are throwing up or coughing. This led me to develop two food-based remedies, one for vomiting and one for coughing. I came up with both of these after researching a large number of Ayurvedic remedies, and trying a few combinations. 1.Make ginger tea. Place the ginger in a small pan with two cups of filtered water, bring to a boil, and simmer uncovered for ten minutes. Remove from the heat. 2.Grate the onion into a bowl, using a hand grater. Place the grated onion in a clean, chemical-free cloth (cheese cloth works fine), and squeeze the cloth-covered onion over a bowl until no more juice drips through the cloth. You should have a tablespoon or so of juice in the bowl. Immediately place the juice in a small cup (like a shot glass), and have the sick person swallow it all at once. It goes down easier if the swallower holds their nose shut with the other hand. This should stop the vomiting immediately. The onion juice should be made just before using. It should be taken immediately after being made, and should not sit in a bowl. 3.10 minutes after the onion juice is taken, one tablespoon of strained ginger tea should be taken. 4.Every 15 minutes for the next hour, take one tablespoon of strained ginger tea. This will help rehydrate the body and prevent further vomiting. 5.After this hour, small sips of broth can be tried. If vomiting reoccurs, the whole remedy should be repeated. Usually, this will not be necessary. Recently, a teenage boy who had the swine flu was vomiting every few minutes. He stopped vomiting after he swallowed the onion juice. Several hours later he gulped down a cold drink and threw up once. He took the remedy once more and never vomited again. The next day he was almost completely well. This remedy could not be easier. You mix one-quarter teaspoon of organic turmeric with one teaspoon of the honey, then swallow it. It should provide immediate relief from any cough. You can repeat this every four hours, as needed. Recently, a woman with severe immune problems caught the swine flu. She was treated with Tamiflu, but developed a constant, horrible wracking cough that was so bad she could not sleep. The cough medicine prescribed by her doctor did not help. She had tried the remedy using non-organic turmeric, and it did not help. I convinced her husband to get organic turmeric. She took the remedy again, and her cough was reduced to a very mild, occasional cough, and she was able to sleep. She never had a bad cough again. She went on to make a full recovery from the swine flu. Doctor Eisenstein, a true Hippocratic physician, explains how to use the product at the bottom of the page. This product, taken with the broth, has never failed us. This would be to go to a doctor. Hopefully, a doctor who listens to his or her patients, is open to alternative remedies, and is much more than a pill pusher. I have not had to go to the third line of defense for over five years. Real food has enabled me and my family to defeat colds and the flu for years. Unlike drugs, the only side effect is that real food improves your general health and immune system. The following recipe for Quadruple Healing Broth is taken from my cookbook, Tender Grassfed Meat: Traditional Ways to Cook Healthy Meat. 4 to 6 pounds assorted free range chicken parts and bones, such as wing tips, backs, necks, carcasses from a roast chicken, legs, wings, etc. 1.Peeling and crushing a whole bulb of garlic may seem like a lot of work. It is actually quite easy with the proper technique. You need a heavy cleaver or rolling pin. Separate the garlic cloves out of the bulb. Place the clove on a wooden cutting board, and press down hard on it with a rolling pin, or the flat of a cleaver. The clove will crack, and the skin will pop off easily. You may need to make one small cut at the root end of the clove to remove the remaining skin. 2.Put the bones and scraps of meat in the pot, except for the giblets. Add the water and the vinegar. Let sit at room temperature for 1 hour. 3.Add all the vegetables. Heat the pot until the water begins a strong simmer. This will take a while due to the large volume of ingredients and water. 4.When the water is close to boiling, remove all the scum that rises to the top with a skimming spoon. This can also take a while, but is necessary. 5.Once the scum is gone, add the giblets, parsley, and the salt. 6.Cover and simmer gently for 12 to 14 hours. 7.Using a ladle, strain into jars, cover, and refrigerate once the bottles have cooled down. The fat will rise to the top, and will solidify in the refrigerator. This fat cap will help preserve the broth. The fat should be removed before the broth is reheated. I am not a doctor, and the above is not intended to be medical advice. Quadruple Healing Broth is a food, not a medicine. By all means, see a doctor if you want medical advice. The above is just a description of how some families deal with colds and the flu.